If there is one dish that is ephemeral, which shape is hard to maintain, it has to be un soufflé. Know this: Soufflé in French comes from the verb “souffler“, which means to blow. Should I then be surprised? No! But yet, how cruel of him, le soufflé, to rise so tall and proud once it has reached the ultimate cooking point, and yet fall slowly or abruptly as soon as he is taken away from the warm nest created by the oven. He goes up to form a beautiful peak, but falls down as if he had received a shot in the head. Pouf! And when Monsieur le soufflé collapses, he takes me with him: I too feel deflated. But tell me. There must be a trick to keep him the same. What do I need to do to be able to eat him before he goes down? So I love to make and eat soufflés, but I can also be frustrated with them. Les soufflés are such whimsical things, don’t you agree? They have a mind of their own. I think however, that I have found a remedy to my problem. This remedy has a name. To avoid the feeling of deflation involved with this king in our kitchens, I decided to give him a good chill to make him cold. I decided to freeze him! Le soufflé gets stuck. Cannot go down and disappear before I notice it. Il est figé ! Immobile. “Stay! I got you. You cannot go anywhere!” This time, he has no choice but to remain tall and proud. But wait! Too warm in here? It just looks as if he were going to melt now. What is wrong with you, soufflé? I remembered seeing this recipe a while ago in an old copy of the French cooking magazine Saveur, at a time when eating cold iced foods was not appealing at all. But these days in the Northern hemisphere at least, as we all know, things are slightly different. Cold desserts are actually immensely attractive. Even for people like me who usually get fussy (the waiter thinking “she is such a pain!”) when she gets too many ice cubes in her glass (“Can I have water without ice, please?”) I thought to give it a try and absolutely loved it. I changed the recipe slightly, mainly due to my grocery limitations since it is practically impossible — or maybe I am looking in the wrong places — to find fromage blanc in the US. Only one Vermont company provides one type that I tried and actually dislike a lot. Of course, I should not be surprised since it is almost fat free (not my cup of tea), nothing like the nice smoothness of what fromage blanc should really be like. Sooooo…I substituted the required fromage blanc with a lovely plain Swiss yogurt I bought and the recipe worked great. 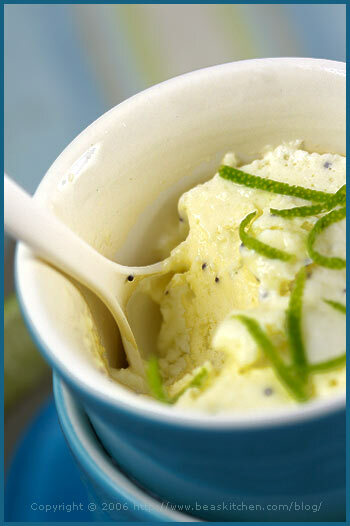 In a few words, if you like lime and the touch of crunchiness provided by poppyseeds, you will love this dessert. I thought of trying different ways to serve it. 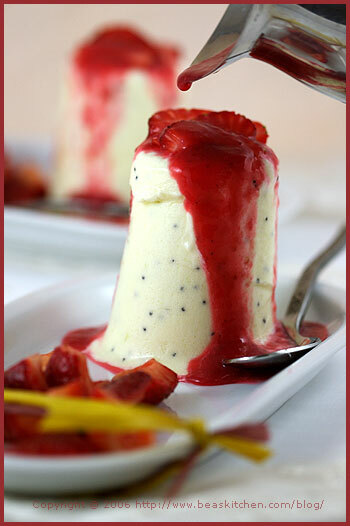 Casual and eaten plain, or more elegant with marinated strawberries and coulis. I also tried with different fruit sorbet I had made (watermelon and Cantaloupe melon). My favorite remains the strawberry/coulis version. A little more work, but really worth it. Me: And would you like more coulis on your soufflé? Who is a spoiled brat? Either way, you’d better be quick to eat your soufflé! In a pot, mix together the egg yolks, half of the cream, the yogurt, half of the lime juice, the cornstarch and the poppyseeds. Bring to a first boil on low heat while stirring constantly, and remove right away. Beat the egg whites firm. Add 1 Tbsp sugar when you start and just before they start to get firm, add the rest progressively. The cream should be firm and shiny. 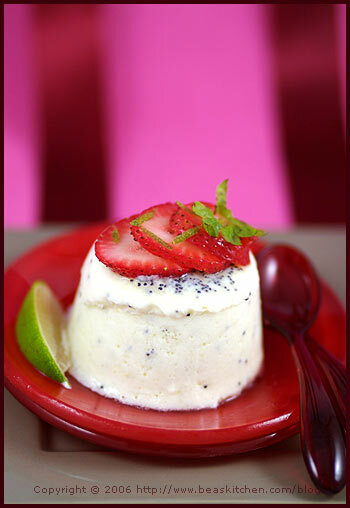 Gently fold this light preparation in the lime cream. 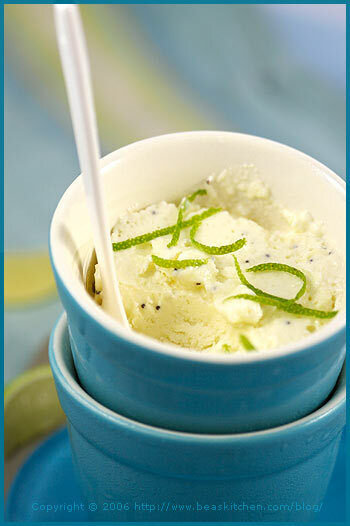 Whip the remaining heavy cream in chantilly and add it to the lime preparation. Take ramekins and place parchment paper around the edges sticking out inside (or use liners). 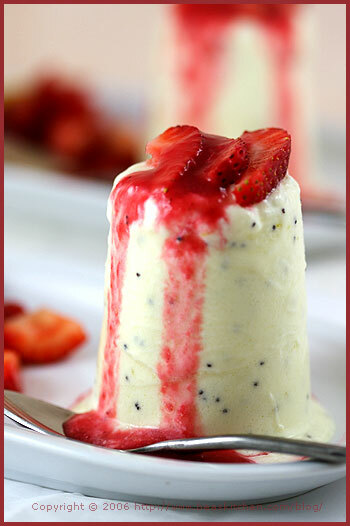 Divide the cream between the molds and place in the freezer for about 4 hours. To unmold, run the blade of a sharp knife between the mold and the liner (You can also dip the ramekins in warm water for 30s). 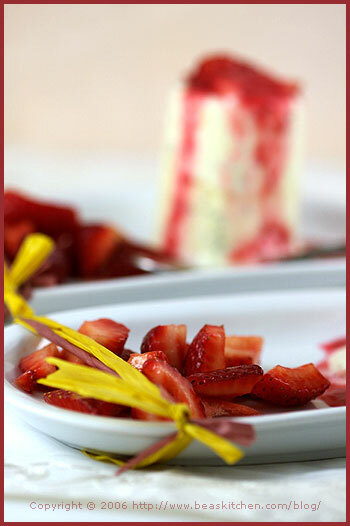 Flip over on plates and serve according to your mood, with or without berries. Mélangez les jaunes d’oeuf, la moitié de la crème, le yaourt, la moitié du jus de citron vert, la maïzena et les graines de pavot dans une casserole. Faites chauffer doucement sans cesser de remuer jusqu’à la premiere ébullition, puis retirez tout de suite du feu. Faites tremper les feuilles de gélatine dans de l’eau froide pendant 5 mns. Retirez-les et pressez-les pour retirer l’excès de liquide. Ajoutez-les à la crème au citron avec le reste de jus de citron vert et le zeste d’un citron vert. Mélangez bien. Montez les blancs en neige ferme. Commencez à ajouter d’abord 1 càs de sucre, puis vers la fin, ajoutez progressivement le reste. La neige doit être brillante et ferme. Ajoutez-la délicatement à la crème au citron vert. Battez la crème liquide froide en chantilly et ajoutez-la à la préparation précèdente. Prenez des ramequins et tapissez-en les bords avec du papier sulfurisé (faites-le dépasser). Divisez la crème entre vos ramequins et mettez au congélateur pour un minimum de 4 heures. Pour démouler, passez la lame d’un couteau entre le papier et le bord du ramequin (vous pouvez aussi tremper les ramequins dans de l’eau chaude pendant 30s, pour faciliter le démoulage). Retournez-les sur vos assiettes et servez selon l’humeur du jour, avec ou sans fruits rouges. Or for un diner plus chic (a dinner more chic), a different ambiance…..
C’est beau, et ce doit être à tomber ! Oh my, another very tempting looking creation! Just beautiful. Superb! I love the idea of freezing the soufflé. I’ve got to try this! dieu que c’est appétissant ! Bea, you are the best! I just love everything that you do. I so much want to be like you when I grow up! And your English is so excellent, unlike on my website!!! I love how you used poppy seeds in this. They are so wonderful with citrus. Your photos are stunning. Yum! I don’t often eat dessert, but this could be breakfast! Is there any worry about the raw egg whites? Will you make this for me and my ‘spoiled brats’ in March?! It looks absolutely heavenly and I would sure adore some right now! je suis comme P, je veux bien les trois. J’ai tout ce qu’il me faut dans les placards, je note et réalise au plus vite! Merci pour la recette, et surtout bravo pour les photos, elles sont superbes! Magnificent! I love the colors here…just scrumptious! C’est tellement beau! Le gourmand devait être content. You have very pretty images, and marvelous food creations. Will come often, from Carcas, Venezuela. 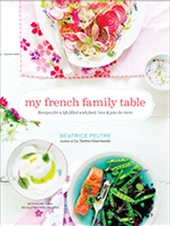 Will try making this soufflé. Will come often, from Caracas, Venezuela. Lime AND poppyseeds? Oh how lovely! Whata great idea to freeze the souffles. Allows you to get the upper hand with this all too fussy dessert. Just wondering can you do this to any kind of souffle? I want mine served EXACTLY like that–with a dusting of poppy seeds, please! It looks fabulous. The poppyseeds are already dancing around me!! Cheers et bravo pour ton superbe blog! Funny Jeff indeed! But this one is safe, not such problem! Anaik, Que Dieu t’entende ! Ben, I would not worry about it. But then, we all react differently to this. Just make sure that your eggs are super fresh. Mayacook, merci et j’espere que tu vas aimer ! Tarzile, ah oui, ca on peut dire qu’il est content ! Maria Luisa, thanks for stopping by. I am glad you are enjoying the recipes and pictures. Come back often for sure! JenJen, yes indeed. I think it is a good question you are asking. I would tend to say yes actually, since the preparation must all be very similar. Diane, merci beaucoup ! Contente de lire que ca te plait ! As usual, your recipes are delicious, the photographs mouth-watering, and the accompanying story led to an almost dangerous incident between my tea and my keyboard 🙂 I’ve put off trying a souffle as I’ve heard of their disappointing deflating, but will have to try this cold solution! OMG ! you just keep them coming!? I think you could win the Good Looking Food Blog everyday of the year ! Extraordinaire. Je viens de tomber sur ton blog/site (grace a mon pote Matt A. ), et je suis aux anges. 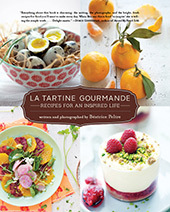 English AND French versions of these recipes? Brilliant. I can’t tell you how wonderful this sounds to me! Poppy seeds – yum! Olivier, bonjour! Ravie que tu sois passee par la ! J’espere a tres bientot ! Emma, thanks! Glad you like. I have a sense you would do amazing things with poppyseeds! I love making frozen souffles, people always love them when I make them. It was my entry for the last SHF. The poppyseeds is an interesting texture that I will give a try. splendide ! je note de suite cette recette de soufflé glacé ! Une merveille avec le coulis framboise !